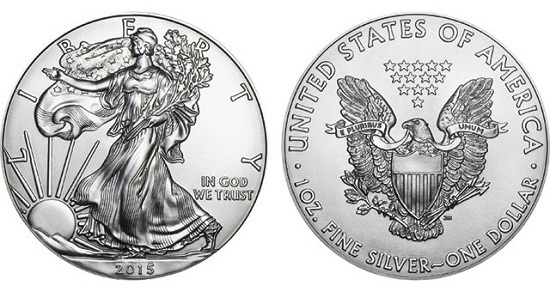 The U.S. Mint has announced that this week’s allocation for American Eagle Silver bullion coins is 1,130,000 ounces. Production on the issues has concluded, making these the last 2015-dated ASE silver bullion coins to be released by the Mint. As noted previously, Silver Eagle bullion coins crossed the 44,006,000 sales mark two weeks ago, making 2015 the biggest-selling year ever for the issues. The most recent 2015 sales total stands at a record 46,639,000 ounces; this number includes 769,000 coins that were sold today, leaving 361,000 pieces left for the year. After the remaining coins are sold, the 2015 total will come to 47,000,000 ounces. American Eagle one-ounce silver bullion coins carry a denomination of one dollar; however, the value of investor coins is tied to their weight in silver, which is currently $13.71 per ounce according to the London Bullion Market Association. In figuring retail prices for the public, authorized dealers add to the Mint’s base price to cover their own expenses and profit targets, often incentivizing bulk purchases by charging less for coins ordered in large quantities. Some distributors are currently accepting pre-orders for 2016 American Eagle Silver bullion coins, but the Mint will not begin officially taking orders for the issues until January 11. For more information on the American Eagle bullion program, please visit the U.S. Mint’s Web site.